As part of its commitment to family inclusivity, Johnson’s® is proud to sponsor Family Equality Council’s National Adoption Month campaign, supporting happy, healthy babies and all the families that love them. 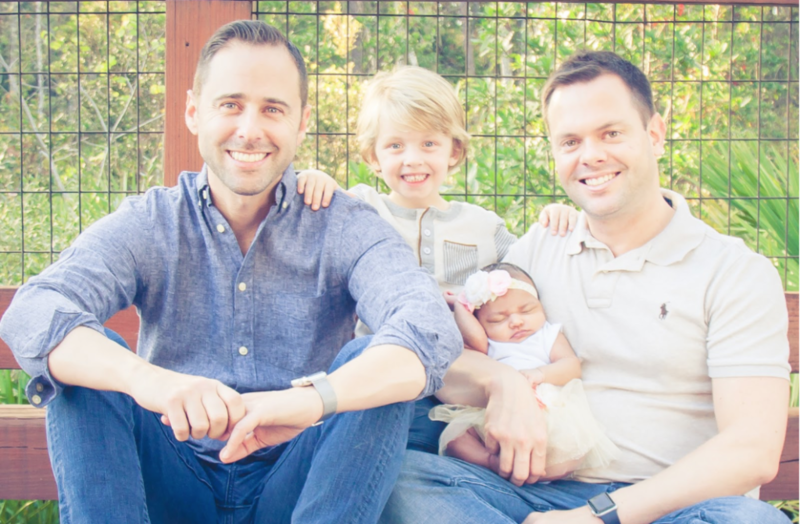 Scott and Josh live happily in Florida with a wonderful community of friends who support their family, but as a gay couple with two young adopted kids, it wasn’t always so easy. Josh was born and raised in Florida, and Scott moved there for college. The two met early in their young adulthood and knew that they wanted to raise a family together. But certain experiences in Florida made them rethink living there. Scott reflects about a time when Josh was severely ill, and he wasn’t allowed to see him in the hospital. After another harrowing story of discrimination, this time in a church, the unit made a decision to move. “A pivotal moment for us was when I was a keynote speaker at a local church. They had brought me in because of my volunteer work in South Africa and they wanted to learn about this girls’ orphanage where these girls have been abused and abandoned,” Scott says. Scott recalls that during the speaking event, the congregation was engaged and eager to learn more from him about the impact of service abroad. “I felt like I was giving these girls, thousands of miles away, a voice,” Scott shared. However, immediately after his speech, Scott was met with the bigotry of the priest. At the end of his presentation, the priest of the church got up and immediately urged his congregation to serve their community by voting against gay marriage. That started the family on a journey of leaving Florida, and leaving the South. 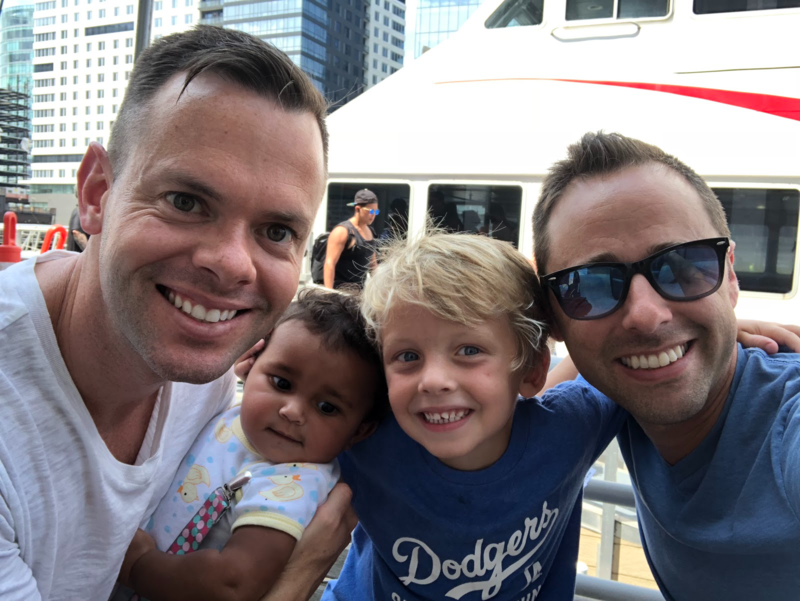 The couple was searching for a like-minded community and a more supportive place for two-dad families, which led them first to Massachusetts and then eventually to California, where they started their family. But even in California, they were met with strange looks and probing questions. For the next few weeks, they continued their bump-ins with those men in the same coffee shop and they continued to experience their stares. Finally, after a couple of weeks, one of the men came up to Scott and Josh and asked them about the couple’s adopted son Hayden. In the moment, Scott decided that having an open dialogue about his family’s adoption was important, and had a conversation with these older gentlemen who had never seen a family that looked like theirs before. Over the course of the next year, living by that coffee shop, every Saturday, Scott and Josh would go in there and see the priest and his friends. Their son Hayden would give them high fives and fist pumps and chat with them. Scott and Josh felt it was fun to see the clergymen come around to recognizing all the different families that are out there. One weekend in June 2015, just days after the Obergerfell Supreme Court decision, Scott and Josh went back to their usual coffee shop. As they were leaving, the group of new clergy friends gave them a card. Curious, the couple asked to know what the card was for, but were urged to not open it until they got home. “We did just that and when we opened it was a happy wedding card. The priest and his friends had all signed a card, congratulating us on our official marriage because of the Supreme Court ruling,” Scott said. It was at that moment the couple decided to move back to Florida. 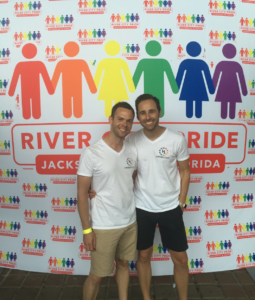 Because of the discrimination Josh and Scott have experienced, the couple founded their non-profit, Hayden’s List, which seeks to let the LGBTQ community know which businesses are supportive and affirming. At the same time, the couple expresses a lot of patience and hope for their community. Right now, Scott and Josh describe their Florida life as being ‘the two-dad family’ in their community. But this time, they feel welcomed. “I think it’s just nice to reflect back on that specific group of friends realizing that had we gotten angry with them or walked away, we may not have had the chance to impact them. Now, today, they all have kids, are raising kids to be extremely accepting, and recognize that all families look different.” Scott said. This story was contributed as part of Family Equality Council’s 2018 National Adoption Month Campaign. Find more stories and adoption resources on our National Adoption Month homepage.